As we know, On November 22, Pakistan Attacked on Indian Soldiers at Machhil in Jammu and Kashmir and three Indian soldiers were killed in an assault. Now, the Army northern command has come up with the latest news that they found evidence that proposed Pakistan Involvement in the mutilation of one of the bodies. Army’s Northern Command posted two photographs – one of a pair of night-vison spectacles showed ‘US Government Property’ and other of materials with Pakistan name. 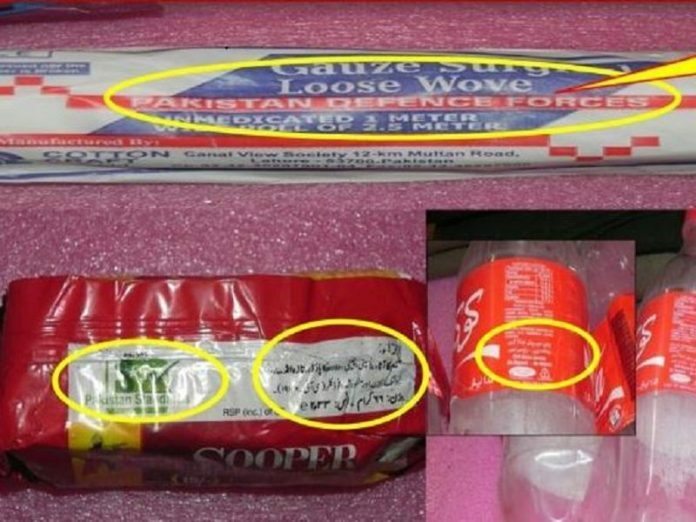 Among the materials was a roll of gauze that ‘Pakistan Defence Forces’ had written on the package. Food items and disposable food cans were also found in the locales, all carrying Pakistan names. The Udhampur-based Northern Command confirmed that Pakistan had a direct role in the disfigurement of a soldier body along the Line of Control (LoC) in Machhil sector of Kupwara district on November 22. The officer also stated that the three soldiers were killed in an attack at Machhil and one of the soldier’s bodies was injured when the secret agent had trapped an army patrol in the Machhil region on November 22. The food items and other materials recovered from the area which shows the Pakistan Labels like Pakistan Defense Force, Pakistan Standard and also the night vision goggles that display the seal of ‘Us Government Property’. “It was the second incident of damage to soldier’s body in less than a month. On October 28, helped by the cover fire by the Pakistan Army, terrorists had crossed the Line of Control and killed an army Jawan and mutilated his body in same Machhil region. Meanwhile, one attacker was killed in that incident. In June 2008, a soldier of the 2/8 Gorkha Rifles lost his way, and he was caught by Pakistani Border Action Team (BAT) in Kel sector. Later he was found beheaded.